Click the photo above to expand and see why we’re peeved. 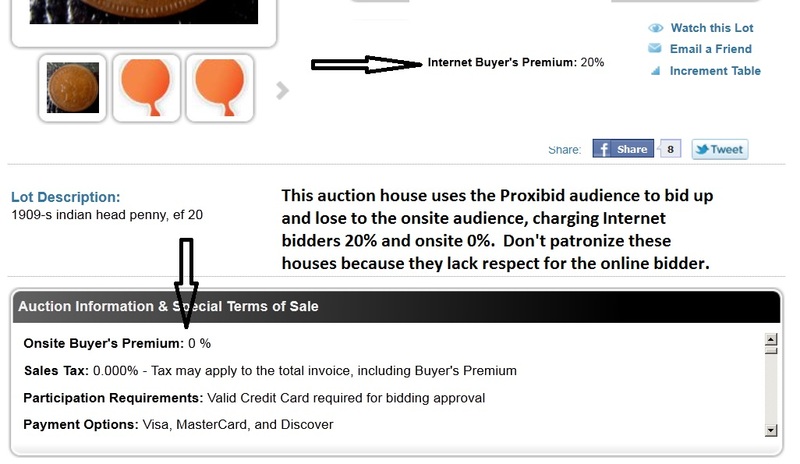 This Proxibid auction house charges onsite bidders 0% buyer’s premiums and 20% online premiums. There are onsite set-up fees for auctions that can surpass that of Internet bidding through Proxibid. Yet auctioneers do not seem to complain about that; they reserve complaints about Proxibid and APN fees. Intended or not, all these houses typically end up doing is using the online audience to bid up the onsite ones. And another warning to the Proxibid sales team: It is one thing to sign up a client, and another to maximize earnings from that partner in your very own business: ONLINE auctioneering. Please advise these folks without relying on posts like this to point things out. In our experience, auction companies that charge 0% BP to the onsite are the loudest complainers about Proxibid. Too bad, especially when our top-ranked companies to the right on our list know that Internet pays well and spurs fair competition. That’s what auctions are supposed to be about!